Holidays, relaxation and recreation in beautiful Hesse (Wetterau) - the cities Ortenberg, Büdingen, Altenstadt or Nidda are just a stone's throw away. Directly on the Vulkanradweg and the Bonifatius route, the world of celts on the Glauberg is just a stone's throw away. Ortenberg is with its central location an ideal starting point of many hiking and cycling. 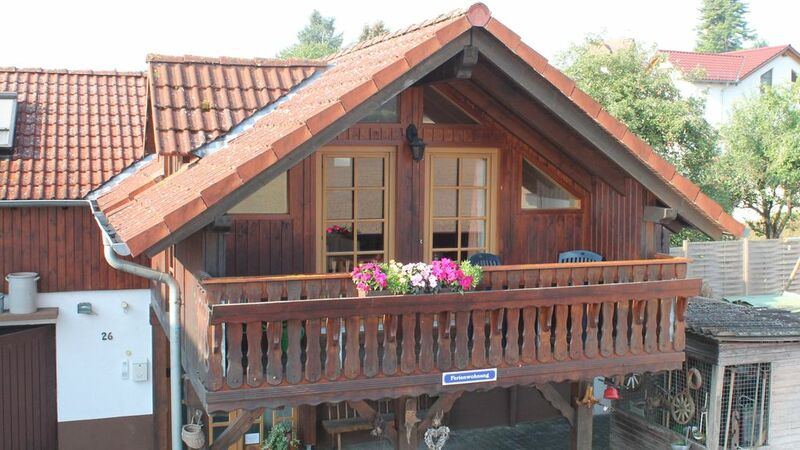 Completely and lovingly furnished holiday home for up to 5 persons. Double bedroom (about 180x200 cm), living room with satellite TV and sofa bed (pull-out for 2 persons approx 140x200 cm), fully fitted kitchen with oven, coffee and espresso capsule machine, separate dining area with table for 6 people, bathroom with shower , corner bath and toilet, sep. Guest toilet on the first floor, bedroom with sofa bed for 2 people (about 140x200 cm), 2 storage z. B. for bicycles or drying of clothes (sep. Entrance at ground level), washing machine, large terrace with barbecue and 2 more balconies, parking (carport), Non smoking, wireless and Internet usage, incl. Bed sheets towels. Directly on the Vulkanradweg and the Bonifatius route (stamp office Effolderbach), the world of celts on Glauberg is only a stone's throw away. Ortenberg is with its central location an ideal starting point of many hiking and cycling in all directions. Experience a holiday in Wetteraukreis and at the foot of Vogelsberg, enjoy extensive bicycle tours to the volcano (Naturpark Vogelsberg) on ​​disused railway lines of Oberwald railway, or pilgrimage them on track and the footsteps of St. Boniface of Mainz to Fulda. The Wetterau and Vogelsberg have much to offer. You have the whole house to yourself - it lives no one else in this beautiful holiday home! Non smoking, wireless and Internet usage, incl. Bed linen, towels - located directly on the Vulkanradweg and the Bonifatius Route (stamp Effolderbach), the Celtic world on Glauberg is just a stone's throw away. With its central location, Ortenberg is an ideal starting point for many hikes and bike rides in all directions. Enjoy a holiday in the Wetteraukreis and at the foot of the Vogelsberg, enjoy extensive cycling tours to the volcano (Naturpark Hoher Vogelsberg) on ​​disused railway tracks of the Oberwaldbahn, or make a pilgrimage along the route and the footsteps of St. Boniface from Mainz to Fulda. The Wetterau and Vogelsberg have much to offer. We stayed in this comfortable, well maintained home for 5 nights. We were traveling to various Christmas markets by rental car. The neighborhood was super quiet, cozy and very charmig. Very well planned out home, kitchen was well equipped, beds were comfortable. Heat worked great which was very important as we came from Florida and the weather was quite chilly. Had a perfect place to park our rental car. Plenty of comfortable furnishings to sit and relax after a busy day of sightseeing. Very nice grocery store just a few minutes away. Brought a pizza in 1 night from a restaurant a 4-5 minute drive away. They also had Greek food which seemed to be what most folks were ordering. The owners Bettina and Axel were absolutely amazing. Very good with communication, were at house on our arrival, helped us unload the cr. Could not have asked for a better experience. Es freut uns sehr zu hören, dass wir Sie mit unserem kleinen aber feinen Ferienhaus für ein paar Tage verwöhnen konnten, wir hoffen sehr Sie hatten einen angenehmen Aufenthalt in unserer Unterkunft. Wir teilen gerne ihr positives Feedback mit unserem gesamten Team. Uns freut es, wenn unsere Feriengäste im Ferienhaus Janne unser Engagement und unseren Service würdigen! Das Haus ist toll. Alles ist vorhanden und in klasse Zustand. Sehr ruhige Lage. Bestens zum abschalten. Trotzdem ist alles was man braucht in 10 Minuten mit dem Auto zu erreichen. Wir haben uns sehr wohl gefühlt. Gepflegte und geräumige Wohnung in schöner Lage mit vielen Ausflugmöglichkeiten. Schöne helle, sehr saubere und super ausgestattete Ferienwohnung - lässt keine Wünsche offen! Tolles Ferienhaus, absolut seinen Preis wert, in schöner ruhiger Gegend - wer direkt vom Haus aus wandern und radfahren möchte, ist hier richtig. We hebben een geweldig verblijf gehad. Alles in de woning was even mooi. Zeer vriendelijke gastvrouw. > UNESCO World Heritage "The Limes"
... and much more offer the Wetterau and Vogelsberg. In our holiday home "Am Blumengarten" you come to rest and relax in a natural way - even for a weekend or a short break! Nichtraucherwohnung - bitte rauchen Sie nur auf den Balkonen oder draußen vor der Haustüre.